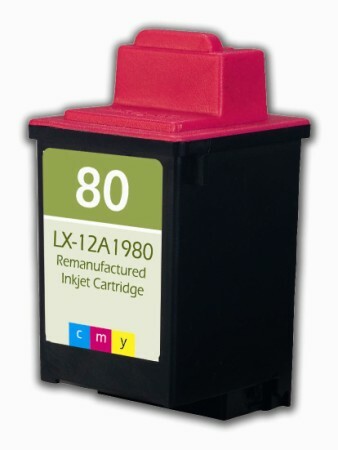 Premium Quality 12A1980 Tri Color Inkjet Cartridge compatible with the Lexmark 3200/ ColorJet 3200/ 5000/ 5700/ 5770/ 7000/ 7200/ Optra Color 40/ 45/ X125/ X63/ X73/ X83 All-In-One/ Xb4/ X85/ Z11/ Z31/ Z42/ Z43/ Z45/ Z45se/ Z51/ Z52/ Z53. The use of compatible supplies does not void your printer warranty. Premium Quality Tri Color Inkjet Cartridge compatible with the Lexmark 3200/ ColorJet 3200/ 5000/ 5700/ 5770/ 7000/ 7200/ Optra Color 40/ 45/ X125/ X63/ X73/ X83 All-In-One/ Xb4/ X85/ Z11/ Z31/ Z42/ Z43/ Z45/ Z45se/ Z51/ Z52/ Z53 is designed to meet or exceed the specifications of the original OEM manufactured cartridge.